Pest Control Courses® has a number of online course options – 5 CEU, 8 CEU and 10 CEU Courses – that the Texas Private Applicator may complete to satisfy a portion of his continuing education needs before he may recertify his Texas Private Pesticide Applicator license. Our 10 CEU Texas Private Applicator Course provides the maximum number of online continuing education units (CEUs) allowed by regulation. The remaining 5 CEUs must be obtained via a live training course. Texas law requires private applicators to earn five of their required fifteen continuing education credits by attending live training sessions. However, private applicators in Texas may take up to ten credit hours via an online CEU course. Pest Control Courses offers an online Texas private applicator course that is state-approved and qualifies for ten online credits. For license renewal, private applicators must earn at least two credits in laws and regulations. They must also earn another two in integrated pest management. Our 10 CEU Texas private applicator course satisfies both requirements. We include two credit hours each in Texas and federal pesticide laws/regulations and nonchemical pest control techniques. Two credits are also designated for pesticide safety. Applicators will learn about the benefits and risks of pesticide use, pesticide toxicity categories, chronic toxicity and material safety data sheets. The course also covers pesticide entry into body through skin, mouth, eyes, and lungs. Benefits and limitations of personal protective equipment is also discussed. A credit hour of pesticide formulations covers the different types of modern dry and liquid pesticide formulations. Students also learn about the pesticides’ respective advantages and disadvantages. When learning about pesticide modes of action, applicators will brush up on common chemical groups. These groups are used in insecticides, fungicides and chemical control of vertebrate pests. 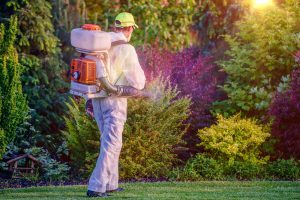 Two credits on emergency situations will discuss the proper actions to be taken in the event of a pesticide leak, spill, misapplication or fire. Requirements of the Community Right-To-Know Act are reviewed. And applicators also learn about first aid actions to take in event of exposure to skin, clothing or eyes. Private applicators are required to take five hours of live training. But our Texas private applicator course covers as many online credits allowable in the state of Texas. And with easy registration, real-life support and a money back guarantee, taking the Texas private applicator course through Pest Control Courses is a smart choice. Contact us today to get started!